Ever since we first previewed Phyrexian mana in New Phyrexia, I've been getting a lot of mail about why Ramp;D chooses to bleed abilities into colors that don't have them. For a while now I've been promising that I was going to write a column to address this issue. Today is that day. By the time I send you off with my weekly "Until then" you will have a much better sense of how and why Ramp;D bleeds the colors in Magic. If that sounds interesting, then read on. If not, you can check out the Pro Tour coverage here. I'll see you next week. Before I can explain why we bleed abilities, I first have to talk about the color pie. I believe a lot of players think of it differently than Ramp;D does. (To be fair, I think of it differently than I believe a lot of Ramp;D does.) My goal with today's column is to get all of you to think of the color pie in a slightly different light than you currently do. This is going to require a lot of words and a bunch of graphs. Please stick with me, though, because I believe it will do a lot to give you a larger sense of how the color pie works. When Planar Chaos came out I tried to explain three concepts I called the core, mantle and crust. The idea behind these concepts is that the color pie has three different scopes to it and that each scope works differently. I feel I did a bad job of explaining this concept at the time (as well as accompanying it with an image that, due to my lack of explanation to the graphics person, came out comically bad; my point in the second graphic was supposed to be that what the public saw as the "color pie" was only the innermost circle), so I want to take a chance to today to do a better job of explaining it. We begin with the three circles. I believe my mistake last time was not separating the circles from the areas within them. Core, mantle and crust apply to the space between—or, in the case of the core, within—the circles. They are not the circles themselves. Today I will explain what the circles represent so that you can understand the space each scope represents. Let's start with the biggest circle. The largest circle represents color philosophies. I have spent a lot of time spelling this out and finally have managed to put together a page with all of my color pie philosophy columns (over 20!) in one place. (Click here to read everything I've had to say about color philosophies. If I'm missing something please let me know.) The color philosophies are a constant. Black means today what black meant when the game came out eighteen years ago. (To be fair, though, we've spent a lot of time since Alpha getting a better understanding of what those philosophies are.) When I say the color pie philosophies are a constant, I mean that each color means what it means and those philosophies are not meant to change. This means that the largest circle is locked in its position. The smallest circle is the current mechanical implementation of the color pie. When most people think of the color pie, I think this is what they think of. These are the choices as they currently stand. What is a color allowed to do? Look inside this circle. What color does a certain effect belong to? Look inside the circle. What color is the primary in the ability? The secondary? The tertiary? Look inside the circle. In the past, we've talked about Ramp;D creating documents about the color pie, or held up charts in photos that you just can't quite read. These represent the circle at one specific point in time. Here's the most important thing you need to understand about the scope of the smallest circle: it moves within the larger circle. The "current mechanical implementation" is just that, the current one. So I've defined the smallest and largest circles. What does the middle circle represent? This one's a little trickier to explain. Imagine for a second that the only circle to exist is the largest one. Now you're going to put the small circle somewhere inside it for the very first time. The small circle can go anywhere because any place within the larger circle is acceptable for the small one because everything within the big circle is within color philosophies. Please understand that once you place the small circle you start making definitions that make it hard to move that circle too far from where it's placed. The weight of history of the inner circle keeps it close to where it started. The important point I'm making here is that the smallest circle could have gone anywhere inside the largest circle. No matter where I place the smallest circle, the following will be true: Some area outside of the smaller circle will feel connected to the smaller circle while some will not. The best way to describe this is that given any choice, some area outside of the choice will feel similar. If I choose a spot on a color wheel (I'm talking an actual wheel of actual colors, like what an artist might use), some spots will feel close to it because they are closer in feel. Orange will feel more red than blue will feel red. As you grow this area around the smallest circle, you will hit a point where things stop feeling close and connected. This is the middle circle. The middle circle represents the area within the color philosophies that have enough similarity that humans will emotionally accept it as related. I often talk about the importance of feel in design as things have to "feel right" to the player. The middle circle is all about limitations through feel. If we define the core as a certain subset, then there will be things that fall outside of those limits but that feel close enough that if we occasionally bleed there, players will be okay with it. The middle circle is therefore defined as a larger subset of the small circle. All of this can get confusing when you look at the graph of the three circles because the scopes I'm talking about don't relate geographically exactly like three circles. The relation is that each one falls within the other. The largest circle is always bigger than the middle circle, which is always bigger than the smallest circle. Now let's get to the scopes themselves. The core is the area that feels natural to the players. This is what the game does. At any one slice of time, this is what colors can do mechanically. The mantle is the area that falls outside of the norm but falls within the accepted feel. This is the area we tend to go when we need to bleed colors to strengthen a particular theme. Normally black and green (and to a lesser extent white) are the graveyard colors, but in a set about the graveyard, we bleed to areas that blue and red make sense in. The crust is the area that is within the color philosophies but is far enough from the norm that it doesn't feel right. The only set to really mess around with design space in the crust was Planar Chaos. That set was all about asking what if the inner circle had been placed somewhere significantly different in the larger circle. Bounce (returning cards to their owners' hands) could have been used to reflect red's willingness to trade short-term gain for long term loss, but it wasn't. Planar Chaos, because it was messing with having the inner circle start somewhere else (the whole set was very much a "what if" set; that's why we pushed the alternate reality theme) had a bunch of cards that played around in the crust scope. These were cards that made sense philosophically but kind of felt off. 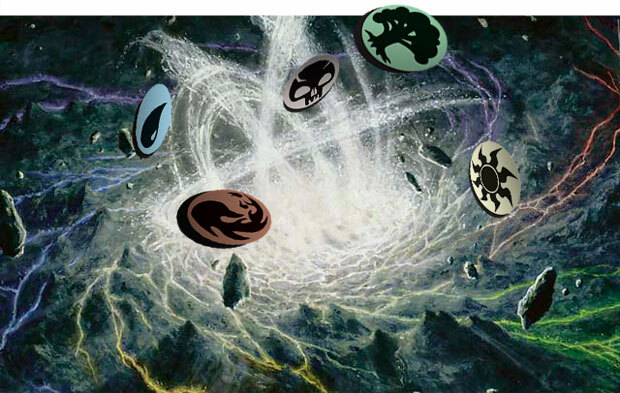 The idea behind Planar Chaos was to demonstrate all the things I've just explained—to show how Magic could have stayed true to the color philosophies (and stayed within the largest circle) yet felt very different. If only I could have properly explained it at the time. As a quick aside, I think of Time Spiral block as my "art-house block" in that I, as Head Designer, really pushed the boundaries of what a Magic set was. I think the three sets are very interesting for the players who "got it," but as the mass majority did not, the set failed in its primary role of just being a fun Magic block. A lot of people get upset with me every time I say bad things about Time Spiral block. I want to be clear. I'm very proud of all our work on Time Spiral block. It's one of my favorite all-time blocks. Future Sight is the hardest design I've ever done as a lead designer and I'm quite proud of it. But to continue the metaphor, we're in the business of making blockbusters, not art-house pictures. Time Spiral block might have had a chance at winning an Oscar, but it wasn't going to be playing extended runs at the local Cineplex. That is the failure I'm talking about. 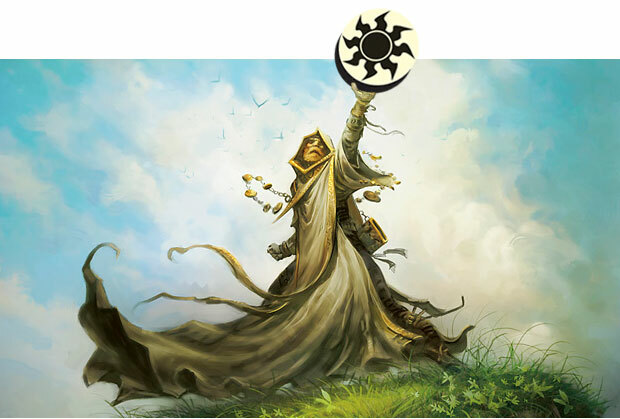 I personally believe that the color pie is the very foundation of the game—that every single bit of Magic, including mechanics, is built on top of it. I wrote an article back in 2003 about the importance of the color pie (The Value of Pie) that sums up all my major issues, so if you haven't read it, I strongly urge you to hit the link and do so. Whenever I talk about restricting designs based on the color pie, I hear from some segment that believes that the color pie is a bad thing, that it exists to keep cool things from happening. My response is that I don't feel that group of players really understands the importance of the color pie. As I explain in my article on it, one only need walk through what a world would be like without it to realize that value it offers the game. The color pie is not a luxury. It's a key tool that allows the game to be what it is. So why do we mess with it? I'm getting to that. I just wanted to stress that it isn't something Ramp;D takes lightly, because we understand its importance. There are lines that shouldn't be crossed, but I believe that line is the outer circle and not the inner circle. The reason this is so important is that sometimes bleeding the color pie is just the first step in us testing out the waters for the next shift. Often when Ramp;D feels like making a shift, we'll experiment with it first in the proper set (that is, a set where the bleed makes sense) to get a sense of how it feels. Back in my college days, I used to do stand-up comedy. One of the earliest lessons I learned doing stand-up was the danger of shock comedy. You can get people to laugh at inappropriate things because it is in the nature of humans to do so. The problem with this technique is that you didn't really earn the laugh meaning that while you got the audience to laugh you did it in a way that wasn't helping your act. You were not building up any comedic equity with shock humor. You were getting cheap laughs. The reason this matters is that at some point shock humor wears off. Things just stop being shocking when you keep doing them. The problem you then have is that you now have no way to make the audience laugh. Shock design is basically the same thing. I can draw attention to a design because it does something it isn't supposed to, but that draw is short lived. In the long run it actually makes it harder to make good designs because you start breaking down the very foundations you need to do build your designs on. As an example, let me talk about the Un-sets (Unglued and Unhinged). An easy trap with an Un-card is to design something that is funny when you first look at it but it has no actual play value. Time after time, I would have designers turn in these type of cards and I would reject them because I knew that the key to making the Un-sets (or really any set) work was having cards that players wanted to keep coming back to. A "one and done" card turns the set into a quickly disposable commodity. Color bleed is very similar. Used properly it's a very important tool. It can help you smooth out a theme that normally sits in only a few colors. It can help you demonstrate how something is amiss in the environment. It can help give identity to a specific character that plays against type. The big question I always ask when I see a card with color bleed is "Why is it in this set?" Usually the answers fall into one of two categories. Answer #1 is "We needed it to do blah, blah blah." Answer #2 is "The card just seemed really cool." I will always listen to answer #1, although I still will often ask for the card to be removed. My answer to #2 is always the same: "Let's save it for a set where it will mean something." Breaking rules solely for the sake of breaking rules is exactly the same to me as a comedian relying on shock comedy to get attention. It works short term, but always at the sake of the long-term health of the item in question. The most dangerous thing I believe bleeding can do is to undo the weaknesses of a color. Sure, red would love to be able to deal with enchantments, but that inability is crucial to the game. The problem here is that there is a lot of desire from the players to bleed in exactly this area. That is because players have an incentive to find ways to overcome vulnerabilities. You see, it's not the players' job to worry about the overall health of the game. You all do what the game incentivizes you to do because you're trying to have fun, and trying to solve the puzzle that is the game. Our job is to not let you completely solve the puzzle. We need to throw obstacles in your way because that is what game design is always about. Unlike just about any other type of design on the planet, game design (and puzzle design) is about not making the task as easy as possible for the end user. People game because they want the mental challenge. They want to have to test themselves. You all don't want to be given the fish. You want to catch the fish. That's why it is crucial for us to not give in to this desire. Colors have to keep their weaknesses, meaning that bleeds have to be extra careful not to fill those weaknesses in. You'll find that historically the biggest color bleed mistakes have come when we let colors do something they're not supposed to be able to do. 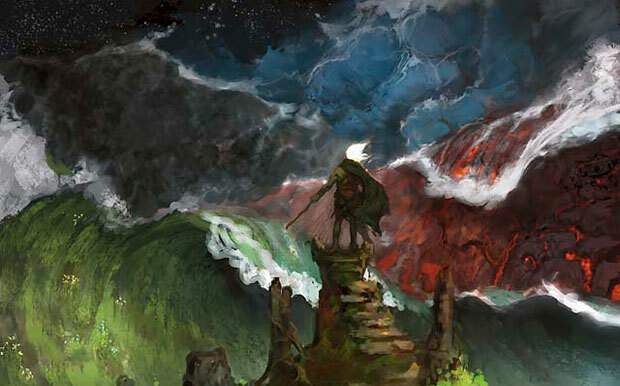 One of the important things that comes up when discussing color bleeds is the fact that Magic has built into it a core component that color bleeds every set, a little thing known as artifacts. One cannot talk about color bleed without discussing the role of artifacts in the game. Before I do that though I need to explain that there are actually two types of color bleed. The first color bleed is when cards are created in a color that do something that the color doesn't normally do. The second type of color bleed is when you create a card that doesn't required colored mana yet allows a certain color to do something it cannot. The second grouping obviously includes artifacts (as well as certain lands). I bring this up because there are two distinct issues that color bleeding brings up. One is color definition—what can a color do? The second is practical application—what tools does a monocolored deck have access to? Artifacts are irrelevant to the first category because they are not in the relevant color. What green can do, color-pie-wise, is defined by what exists on green cards. The second category of color bleed, though, very much cares about what artifacts (and other cards that can be cast without paying colored mana) bring to the table. The artifact color bleed problem is solved in two ways. First, we try to avoid letting artifacts break rule #4 above. Have you ever noticed how hard it is to do pinpoint enchantment removal in artifacts? We know doing so would undercut red's weakness, so we are very careful about not letting artifacts have access to that ability. Second, we watch power levels. (This is obviously more of a development task.) If we don't want a certain color doing something strongly, we make sure that artifacts that do that thing do it at a power level lower than that of the colors that are suppose to excel at that ability. This brings us to Phyrexian mana. The flavor of Phyrexian mana is that it's a cross between flesh and metal. In other words, it is splicing together the flavor of a colored spell with that of an artifact spell. This, for example, is why every permanent with Phyrexian mana is an artifact. Because of this feel, we treated the color bleed much like we treat artifacts. The subtle difference here from normal artifacts is that these cards are colored, and thus impact both types of color bleeding. This creates an uneasy sense as colors are clearly doing things they are not supposed to do. We liked some of the uneasiness as it helped created the Phyrexian feel we wanted. The idea was to keep these cards to artifact standards to make sure that while we were bending the first style of color bleeding, we were being more careful of the second. If you think of the Phyrexian-mana cards as being artifacts, even the instants and sorceries that aren't technically artifacts, you'll see that the color bleeding isn't too severe. Yes, there are some cards that stretch the boundaries even with this limitation, but only a handful. These were the cards that got the most internal discussion. Are there Phyrexian-mana cards I wouldn't have printed? Yes, but the group dynamic of Magic's design and development is so good for the game overall that little things slipping through that I disagree with is a tiny evil to pay for a much greater good. The final thing to think about when looking at a bleed, is to step back and look at the card in its entirety. The poster child of this lesson is the card Form of the Dragon. When looked in isolation, many of these abilities feel very out of flavor for red. But when you pull back and get an overall sense of the card—the player-as-planeswalker turning into a dragon—you start to get a flavor that very much feels at home in red. As Magic does more and more resonant design, this is an important distinction to keep in mind. Today's issue is very complex. The game needs some color bleeding to allow Ramp;D to do the things it has to do to make the ever-evolving game of Magic. Some of it is on purpose and some of it is a byproduct of larger issues. The key to doing color bleeding is for Ramp;D to be conscious of the bigger picture and make sure that it's not doing the type of color bleeding that would unravel the base foundations of the game. To use a metaphor, you can knock down a wall ever once in a while—just make sure it's not a bearing wall that's holding up the house. In the big picture, I'll leave it this way: Ramp;D has to meddle with the core, we have to access the mantle judiciously, and when we touch the crust we have to be very careful we're not messing around with what lies outside of the largest circle. And with that, I'll call it a column. I'm very eager to hear what all of you have to say on this topic (be it in my email, my Twitter—@maro254—or in this column's thread). I doubt this column will be the end of this issue, so I'm eager to for more voices on the topic. Join me next week when I take a peek at the Command center. Until then, may you only require a Band-Aid and not a tourniquet.